The fight for equal rights for working women remains an uphill battle. That’s one reason why about 3 million people around the world recently participated in women’s marches and thousands took part in demonstrations on International Women’s Day. An analysis from the Center of American Progress estimated that A Day Without a Woman could have cost the U.S. GDP $21 billion if every woman who worked outside the house went on strike. This is the third annual analysis of the best cities for women in tech. Read the 2016 study. While it’s well-known that women make key contributions to the economy, gender disparities remain, particularly in the tech industry. A recent report from the National Center for Women & Technology explained that women made up 57% of the professional workforce but only 25% of the employees in computer-related occupations in 2015. When considering the number of female tech workers in leadership roles, the numbers look just as bad. According to Silicon Valley Bank’s 2017 Startup Outlook Report, roughly 70% of startups say they have no women on their boards of directors and 54% report having zero women in executive roles. Gender pay inequality remains in the tech industry as well at every level. Data from Payscale reveals that the uncontrolled gender pay gap for individual contributors and managers/supervisors is 19% and 22%, respectively. But that’s not the case in every U.S. city. 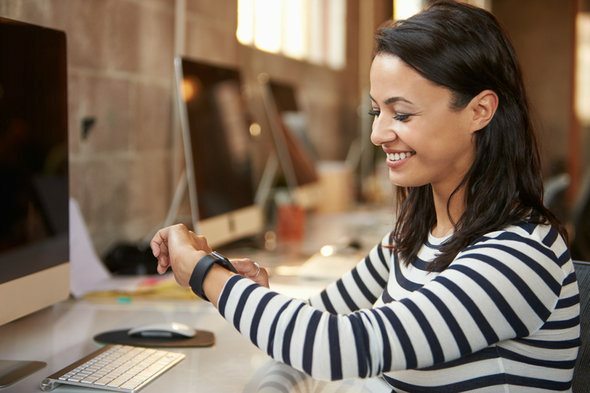 In order to identify the places with the smallest gaps in gender pay and the highest ratio of female tech workers, SmartAsset ranked the best cities for women in tech. To find the best cities for women in tech, we pulled data on men and women in computer and mathematical occupations. We looked at 59 of the largest U.S. cities in which there are enough tech workers to provide statistically reliable data from the Census Bureau. Then we ranked them across four metrics: the gender pay gap in tech, income after housing costs, women as a percentage of the tech workforce and four-year tech employment growth. Read our data and methodology section below for more information about how we completed our analysis. Women are still the minority – Nationwide, the percentage of computer and mathematical jobs filled by women remains around 26%. D.C. takes the top spot on our list – The nation’s capital ranks as the best city for women in tech. It also ranked first in the 2015 and 2016 edition of our analysis. It has one of the smallest gaps in gender pay and has a higher proportion of women in computer and math-related roles than most cities across the country. The gender pay gap isn’t getting smaller – Based on our analysis, we found that the average female-to-male earnings ratio is 84.8%. Last year it was 86.7%. While female tech workers earn more than their male counterparts in a few cities, more needs to be done to ensure that women are receiving equal pay for equal work. For the third year in a row, Washington, D.C. ranks as the No.1 city for women in the tech industry. Between 2014 and 2015, the percentage of tech jobs filled by women rose by about 1.5%. So female employees now make up 41% of the tech workforce in D.C. The bad news? The gender pay gap has slightly widened. The female-to-male earnings ratio in D.C. is 94.8%, down from 99.3% in last year’s analysis. Kansas City ranks as the second-best city for women in tech for the third consecutive year. Census Bureau data reveals that there is still no gender pay gap in the city. In fact, women earn more. In 2015, median pay for women and men in computer and mathematical occupations was $69,770 and $67,461, respectively. Tech employment in Kansas City grew by 10% between 2012 and 2015. But unfortunately, the percentage of tech jobs filled by women has declined over time. Women now make up about 30% of the workers in computer and mathematical roles. In 2014, they made up roughly 34% of that segment of the tech workforce in KC. Baltimore is another frequent flyer on our list of the top cities for women in tech. It now ranks as the third-best city, up from fourth place in last year’s analysis. Charm City’s tech workforce has grown substantially within the past four years. More than 12,400 computer and mathematical jobs were added between 2012 and 2015. Women make up 32.5% of the people with those jobs. Compared to what we found in the 2016 edition of our study, that’s a 4.2% increase in the number of tech jobs filled by women. Indianapolis is one of several major cities without a gender pay gap. Median pay for women in computer and mathematical roles is around $61,497. That’s about $1,300 more than the median pay for men with the same jobs. After paying housing costs like property taxes and homeowners insurance, women end up with about $51,393 that can go toward other living expenses and savings. Compared to other big cities across the country, New Orleans appears to be one of the ones with a better environment for female tech workers. Women and men in mathematical and computer occupations earn about the same amount of money. And women fill about 35% of those positions. The number of tech jobs (math and computer-related positions) in New Orleans grew by about 32% between 2012 and 2015. That’s the largest four-year change in tech employment growth in our study. Based on our analysis, the only other city with an equally large increase in tech jobs is Mesa, Arizona. Women make up only 27% of mathematical and computer jobs in Fremont and on average earn 16% less than their male counterparts. Median annual earnings for men and women in 2015 were $110,900 and $93,320, respectively. Fremont is home to startups like Emantras and GlassPoint Solar. The Tesla factory is also located in the city. Despite NYC’s reputation for being a major tech and startup hub, employment in computer and mathematical occupations only grew by about 15% between 2012 and 2015. Women make up less than a third of that part of the tech workforce and earn 10% less than men, on average. The Detroit metro area recently ranked as the eighth-best place for pay in STEM. The Motor City also ranks well when it comes to pay for female tech workers. Women in mathematical and computer occupations earn nearly 5% more than their male counterparts. But men’s earnings have caught up. When we published last year’s study, the female-to-male earnings ratio was 122.8%. Although Detroit has fallen in the rankings since we last looked at the best cities for women in tech, it ranks first for having the highest percentage of computer and mathematical jobs filled by women. Female employees make up 42% of that portion of the tech workforce. Along with Detroit, Denver ranks as the eighth-best city for women in tech. Since we released last year’s analysis, the gender pay gap in Denver has widened. The average woman in the city now earns almost 6% less than the average man in a computer and math-related job. A lack of pay equity is a problem. But, fortunately, the average female tech worker earns enough to afford to live in Denver. Census Bureau data reveals that the average woman in computers and mathematics has about $56,680 left over after covering the cost of housing expenses. If that inspires you to want to buy a house in Denver, it’s best to do so while you can. It recently ranked as one of the top 10 hottest housing markets. In terms of the cities with the highest percentage of women in math and computer-related jobs, Philly ranks eighth. What’s more, its gender pay gap has narrowed. The female-to-male earnings ratio is 92%, up from 89.5% in last year’s study. Nationwide, women in computer and math-related roles earn about 15% less than men. For nearly a decade, members of the tech community have met annually to pay tribute to the women who are part of New Mexico’s tech scene. And they sure have something to celebrate. The gender pay gap for workers in mathematical and computer roles is nearly nonexistent. The average man with one of those jobs earns about 1.4% more than his female counterparts. Plus, the percentage of tech jobs filled by women (in math and computer-related roles) increased by 2.6% between 2014 and 2015. Median annual earnings for women in St. Paul in computer and mathematical positions were $61,034 in 2015. Men in similar roles earn roughly 13.8% more, indicating that the gender pay gap in St. Paul has widened. Now, it’s only slightly smaller than the national average. One reason why St. Paul ranks among the top 15 cities on our list is its relatively large four-year tech employment growth. The number of math and computer-related jobs in the city increased by 18% between 2012 and 2015. That’s faster than average. Charlotte ranks as the 13th-best city for women in tech, up from the 32nd spot in the 2016 edition of our analysis. In the past year, we’ve found that the gender pay gap has shrunk by 3%. But the number of women in computer and mathematical jobs remains the same. Female tech workers make up just 27% of those roles. Milwaukee is less than two hours away from the capital of Wisconsin, by car. Between 2012 and 2015, more than 200 computer and mathematical roles were added, bringing the total number of tech jobs in that sector to just under 10,000. Women hold 30% of those jobs and earn about 3% less than men with the same jobs. When we released the 2015 edition of our study, the female-to-male earnings ratio in Houston was 91.8%. But since then, the gender wage gap hasn’t improved. For women with jobs in mathematics and computers, it rose from 8.2% in 2013 to about 12% in 2015. The number of computer and math-related roles for men and women grew by 15% between 2012 and 2015. Gender pay gap. This is the ratio of median earnings for women in computer and mathematical occupations to median earnings for men in computer and mathematical occupations. Income after housing costs. 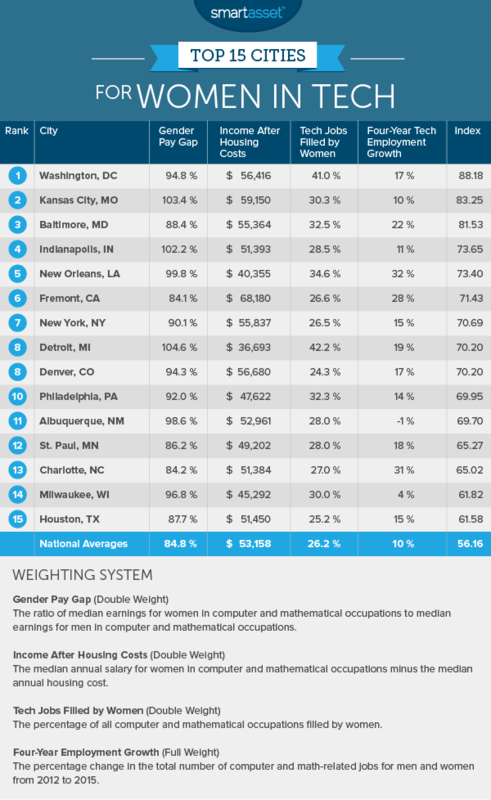 This is the median annual salary for women in computer and mathematical occupations minus the median annual housing cost in each city. Tech jobs filled by women. This is the percentage of all computer and mathematical occupations filled by women. Four-year employment growth. This metric shows the percentage change in the total number of computer and math-related jobs for men and women from 2012 to 2015 (the most recent year for which data was available). For this factor, we used one-year estimates from the ACS. We ranked each city across each of our metrics. Then we averaged our rankings, giving full weight to the tech employment growth factor and double weight to our other three factors. Finally, we created an index and gave each city a raw score. A city that ranked first in every category would receive a 100, while a city that ranked last in every category would receive a zero. None of the cities received a perfect 100, but a score that’s close to that reflects a better environment for women in tech. Working women also need to make sure they’re ready for retirement when the time comes. If you want to maximize your income for retirement, make sure you’re contributing enough to your 401(k). Another way to prepare for retirement is to hire a financial advisor to help you plan. According to industry experts, people who work with a financial advisor are twice as likely to be on track to meet their retirement goals.